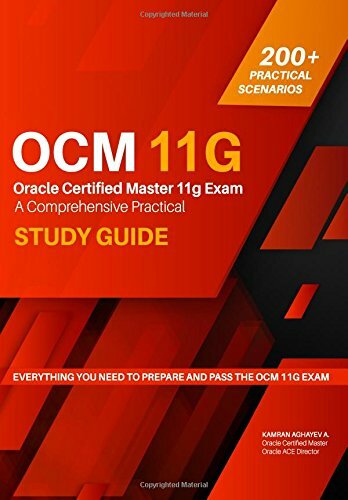 When I first heard about Kamran's new book, OCM practical guide, I said wow, because I was thinking on the same line a few years back, but, dropped the idea due to several factors, including the fact that the time and efforts required on this book.When he approached me to be one of the technical reviewers, I have accepted the deal straightaway without having a second thought. I am really honored to be part of this wonderful book which unfold the knowledge and help OCM aspirants to get what they dream in their lives. I remember the debates at various places and at several Oracle forums where people discussed about the necessity and advantages of being Oracle certified professional. There were so many discussions and debates whether being certified professional will really add any value to one's career. Anyways, this is not the platform to discuss such things , however, in my own perspective, with real experience and having certification surely boosts the career and gives more chances to advance in the career. First thing first, Kamran really put his heart out to come-up with such an extraordinary book in the form of practical guide. I thoroughly enjoyed reviewing every bits and bytes of the book, and the amount of practical examples demonstrate in this book is just prodigious. Only one with the real world and tremendous experience in the technology could do that. Take a bow my friend. Server Configuration provides a detailed step-by-step guide on Oracle 11g Database Software setup and new database creation through GUI and silent mode likewise. Also, outlines the the procedure to configure network settings, listener, tns names and etc. Enterprise Manager Grid Control explains step-by-step procedure to install and configure OEM, and how to schedule and manage stuff. Managing Database Availability one of the important chapters, not only for OCM preparation perspective, to manage our production databases, deploying optimal backup and recovery strategies to secure the databases. 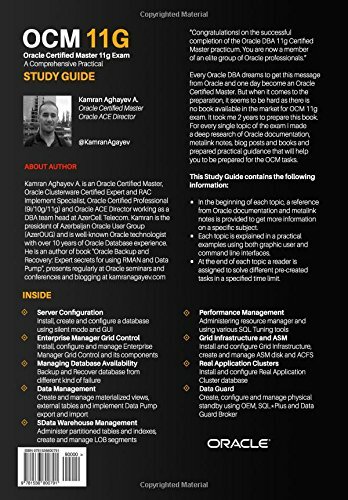 Data Management chapter provides detailed information about types of materialized view and materialized view log and how Oracle uses precomputed materialized view instead of querying a table with different aggregate functions and provides a quick result. Data Warehouse Management chapter provides information about main data warehouse topics such as partitioning and managing large objects. Next, we talk about large objects and show how to use various SecureFile LOB features such as compression, deduplication, encryption, caching and logging. Performance Tuning I particularly enjoyed this reading and reviewing this chapter, Its the heart of the book with so much explanation and practical examples. This one shouldn't be missed out. Grid Infrastructure and ASM contains all you wanted to know about GRID infrastructure and ASM technologies. How to install GRID and create disk groups. Real Application Clusters explores steps to successfully create a RAC database on two nodes. With only few additional steps, you will successfully create a RAC database. Then you see the way how to create and configure ASM with command line interface. Once ASM is configured, silent RAC database creation steps are provided. Data Guard chapter starts by creating a data guard using command line interface, OEM and data guard broker. It also provides steps on performing switchover and failover using all mentioned tools. In nutshell, its a practice guide with a perfect recipe and ingredients to become an OCM, which evenly blended with many useful examples and extraordinary explanation. The wait is over, this is the book we all been looking for a long time. Go and place your order and get certified, become an OCM. Is Fixed Objects Stats needed in PDB? Doesn't matter if we are working on a new technology or something we are very family with. When we encounter tricky situations, sometimes neither we could find things in the manuals nor could find any useful references. All what you need is an action by yourself and then become a reference to others . Mike Dietrich had received an interesting question about whether Gather Fixed Objects required for an indiviudal PDBs or just required on the ROOT Container. He did a small test and explained the answer at oracle.blogs. The Critical Patch Update for October 2016 was released on October 18th, 2016. Oracle strongly recommends applying the patches as soon as possible. On Exadata dbnodes, we noticed that Clusterware 12.1.0.2 ora.cvu resource generating XML reports every 6 hours and occupied large amounts of space on /u01 filesystem. Perhaps this is the same on non-Exadata systems too, if you are running 12.1.0.2 Clusterware. Upon looking into MOS ID (reports from ora.cvu resource using excessive disk space (Doc ID 1964482.1) it was learned that this is an expected behavior with 12.1.0.2 where ora.cvu invokes Clusterware Health check (CHC) every 6 hrs and stores the XML reports under $GI_HOME/cvu/baseline or $ORACLE_BASE/crsdata/@global/cvu/baseline' location. However, the CVU didn't clean-up the reports periodically which ultimately causes disk full. Quick workaround to this problem is to delete the files (xml) manually in order to release the space. Learn and master the concepts of Oracle RAC 12c and EM 13c from Experts, online Instructor lead course. Enroll now and avail 20% discount upfront, exclusively for my network. Day 2 : Taking all your questions. Exclusively taking your questions and answering them. Guys, do forward this to your networking and help your friends/dears to master Oracle RAC and EM 13c concepts. To master Oracle Real Application Clusters 12c. 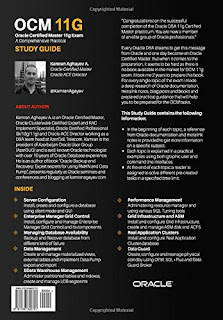 Course is for Oracle DBAs or Apps DBAs looking to upgrade their skill.